The vegetables for this tasty side dish may be cooked in an iron frying pan or on a stovetop griddle, or on the barbecue or roasted in the oven – whichever is most familiar and easiest for you. If you have not used Angostura bitters in food before, start with 1/2 teaspoon in the mayonnaise. Taste, then stir in 1/2 teaspoon more if desired. Serve veggies hot as a side dish, or roast ahead of time and serve room temperature as an appetizer using the mayonnaise as a dipping sauce. Whisk together mayonnaise, grated cheese, 1 Tbsp. lemon juice, lemon peel, and 1/2 to 1 tsp. Angostura bitters. Set aside. Rinse vegetables and drain well. 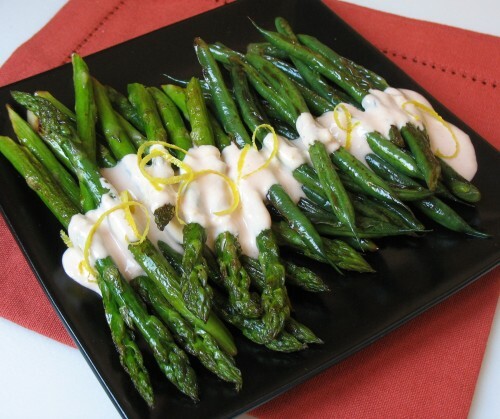 Break off tough ends from asparagus. Whisk together olive oil, soy sauce, 1 Tbsp. lemon juice and 1 tsp. Angostura bitters. Brush liberally on vegetables; let stand 15 minutes. Heat a large iron fry pan over medium heat. Place vegetables in pan in a single a layer. Cook about 5 minutes or until lightly browned. (The time depends on how thick the vegetables are.) Turn and cook 3-5 minutes more or until tender. Cook in two or three batches, as necessary. To serve, warm up Angostura mayonnaise in microwave for 15-30 seconds; stir well. Drizzle over hot vegetables. White and Wild Asparagus - Where?